A team of students from our University is developing a newly designed unmanned drone that could change the face of humanitarian aid. Team Bath Drones is a group of final year students at the University of Bath, led by Wojciech Wasinski and supervised by Dr Pejman Iravani, Dr Jon du Bois and Dr David Cleaver. Team Bath Drones, a multidisciplinary group of students from the Aerospace, and Integrated Mechanical & Electrical Engineering (IMEE) degree programmes at Bath, is developing a drone with the latest technological capabilities that could play a major role in the future, helping those in need around the world. An unmanned aircraft system (UAS) - commonly known as a drone - is an aircraft without a human pilot on-board. They are predominantly known for their use in military and special operations, however a growing use of this technology is in humanitarian aid. Most recently, drones have provided surveillance and intelligence of remote areas affected by natural disasters such as the Nepal earthquake. Drones are also a new way of delivering supplies to those in need in war zones such as Syria, where areas are cut off from aid by conflict and people are prevented from getting food and medical supplies. 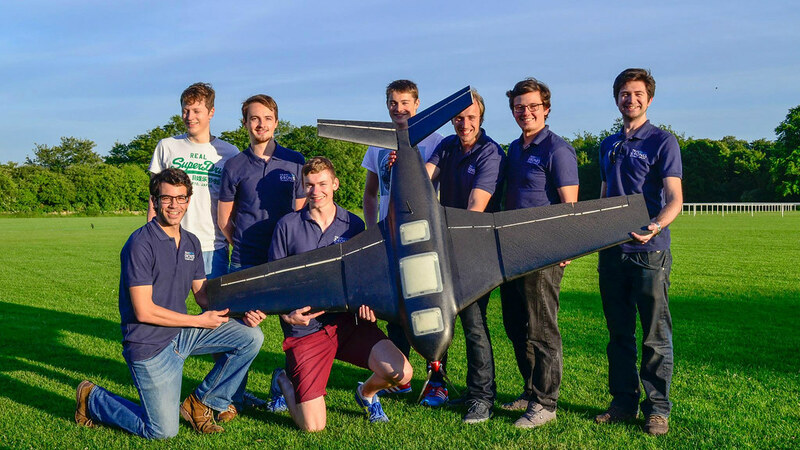 Team Bath Drones’ design, Stingray, has been designed with the primary focus on speed, range and autonomy as the team look to win the IMechE Unmanned Aircraft Systems (UAS) Challenge. The UAS competition is designed to get students thinking about the contemporary needs of the rapidly evolving drone industry. The Bath students, who are currently in the testing and assembly stages, are one of 14 university teams to be participating at this year’s competition. The teams will compete in a ‘fly off’ on 1 and 2 July at Bruntingthorpe Aerodrome where their drones will be challenged to fly between a number of pre-determined points and deliver a small package, mimicking the humanitarian use of drone technology in real world scenarios. The team at Bath has embraced the full mission requirements, designing a rugged, efficient aircraft capable of long-range communication and with a 50 kilometre round-trip range. The drone uses modern composite materials with a cutting-edge monocoque construction and an efficient blended wing-body design, to provide a lightweight but robust vehicle. Long-range communications including telemetry and video feed are provided by a directional antenna at the ground station which tracks the aircraft’s location, and state-of-the-art ‘sense and avoid’ systems are being investigated to ensure safe autonomous operation in shared airspace. Taking a challenging and unique approach, the Bath students are embarking on the development of their own autopilot, with the intention to strengthen this capability year-on-year to become the first team to fly with no off-the-shelf systems. Lecturer in the Department of Mechanical Engineering and one of three supervisors of Team Bath Drones, Dr Jon du Bois said: “This event is a fantastic opportunity for the students – they’re working on a challenging and highly relevant topic in modern aerospace engineering, pushing the envelope of the industry’s capabilities – and they’re getting hands-on, practical experience with design, build, certification and test processes. “The team brings together a truly multidisciplinary group of students from our Aerospace and Integrated Mechanical & Electrical Engineering degrees. The University’s Faculty of Engineering & Design has always encouraged this integrated approach and it is something that is not only valued by industry but is also hoped to give the team the edge in the competition. Team Bath Drones has benefitted from the support of a number of sponsors including The University of Bath Alumni Fund, Unmnd, Santander, CNC-Step, National Instruments, Emkay Plastics and Ami-con. Three academics have established the team activity at Bath: Dr David Cleaver, Dr Jon du Bois and Dr Pejman Iravani. All of the research carried out by the University’s Departments of Electronic & Electrical Engineering and Mechanical Engineering was ranked ‘internationally excellent’ (3 *) and ‘world-leading’ (4 *) for its impact by the 2014 Research Excellence Framework (REF), an independent assessment of UK university research activity.